When I think of bagels, I think of New York. 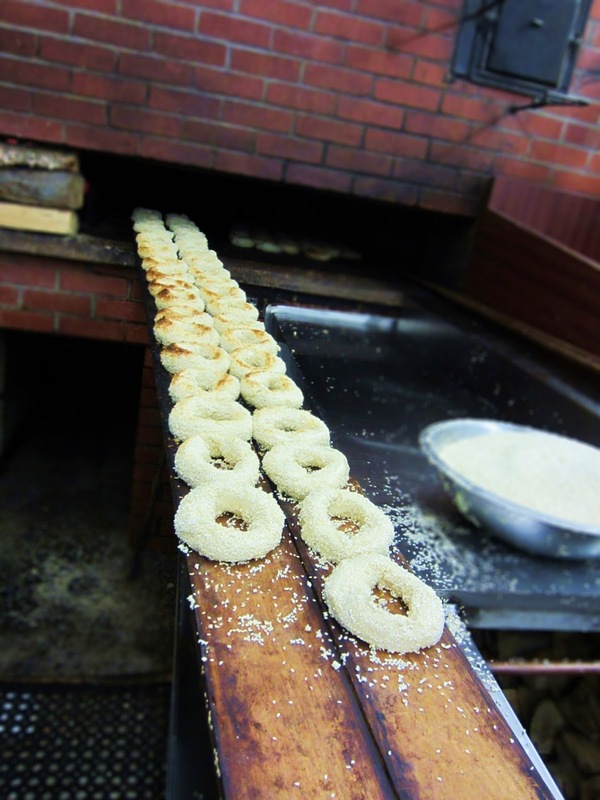 In fact, if you're American, you might assume that bagels were invented in New York City; however, they actually originated in Krakow, Poland around the 16th century. 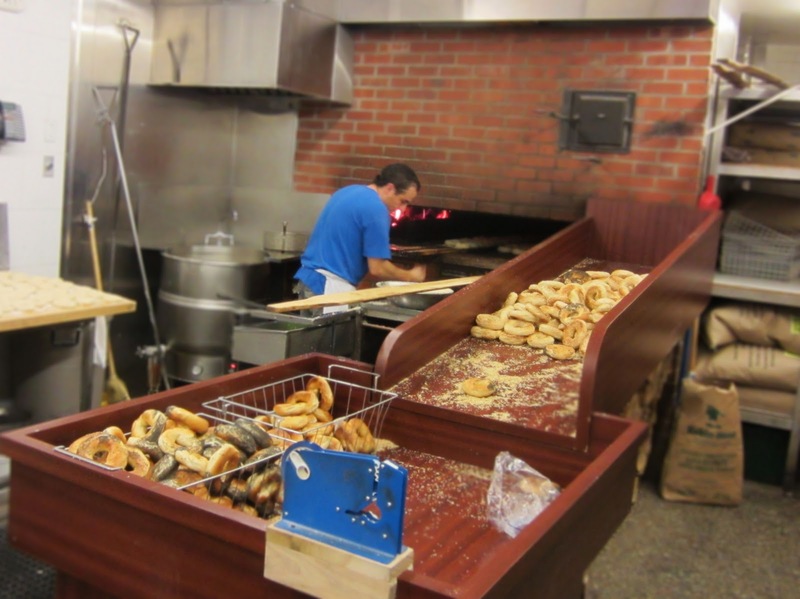 As Polish Jews traveled to North America, two major varieties emerged: the New York-style bagel that Americans know, and the Montreal-style bagel popular in Canada. This morning, I visited St. Viateur Bagel Shop, which has a reputation for being one of the best sources of crunchy baked goodness in the city. These guys know their stuff: they've been making bagels by hand since 1957, and they make literally 1000 dozen bagels every day. When the dough is ready, a baker cuts lengths of it into strips, which he then hand-rolls into the round shape that we're all familiar with. In five minutes, he can shape 44 bagels. The rolled dough then goes into a vat of boiling, honey-sweetened water for another five minutes. 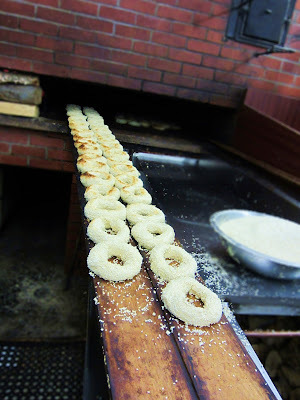 Afterward, the bagels are placed in a brick oven for 20-25 minutes. They're flipped over once during the baking process, since oven heat only comes from one direction. After around a half hour total of shaping, boiling, and baking time, the dough transforms into wonderful, crisp-on-the-outside-soft-on-the-inside Montreal bagels. I devoured two in short succession. Johnny from the bagel shop informed me that there were three more things I had to do in order to get the full Montreal experience: eat poutine, visit a local bar, and eat smoked meat. More on the rest later! * Hey, we're in Canada - hockey is so important here that the five-dollar bill features a hockey scene on the back, as well as short poem that reads, "The winters of my childhood were long, long seasons. We lived in three places - the school, the church and the skating rink - but our real life was on the skating rink." Great post - agreed! And Montreal bagels are without a doubt not even comparable to NY bagels! (even though I'm a Montrealer, no bias!) And if you really want to the full Montreal experience, you a) have to go to Mount Royal BAgel (take my word for it, those are montreal's best). And there are so many more wonderful things you must do in Montreal! You should have a picnic on the mountain, visit St. Josephs Oratory, check out old Montreal! I guess as long as you cover the food, you're doing well! Have fun!